The artisans of Bethlehem have a handicraft tradition that dates back centuries, using techniques that have been passed down from generation to generation. While traditionally the artisans have sold their wares to travellers visiting the Holy Land, the ongoing conflict there has reduced tourism to a standstill and the artisans' businesses to nothing. 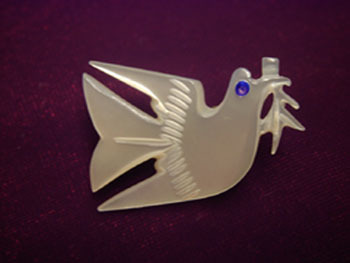 Yet still they continue to believe in peace, as reflected in this hand-carved mother of pearl peace dove, as well as the Peace Dove Necklace Pendant, hand-carved from olive wood.